Three layers of material make up the Vollrath 69112 Tribute® frying pan. The interior and exterior are made of stainless steel with an aluminum core. This makes the pan durable and corrosion resistant, while ensuring heat transfer is uniform on the bottom and sides. Insulated and made of silicone, the TriVent® handle protects the user from heat. Cookware material features are broken down in the cookware materials buyers' guide. "I bought 3 different size fry pans and they all perform great. They cook evenly and you can cook at a lower temperature saving time and money. St..."
"Pan works great, but after less than 20 uses the non-stick coating began flaking off around the edge of the pan. Only a 90-day warranty. $4+ a..."
"This is my second Vollrath pan and I am enjoying this one as much as my first. This is my first non-stick pan from them and it performed wonderfu..."
"I bought 3 different size fry pans and they all perform great. They cook evenly and you can cook at a lower temperature saving time and money. Steak, chicken and pork have been awesome and breakfast foods cook well too and the clean up is a breeze. 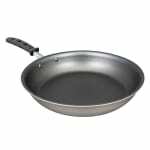 Great fry pans at a great price. I will buy again when needed. Thanks Vollrath." "Pan works great, but after less than 20 uses the non-stick coating began flaking off around the edge of the pan. Only a 90-day warranty. $4+ a use before it becomes defective. Expected a better warranty on a product with this price point." "This is my second Vollrath pan and I am enjoying this one as much as my first. This is my first non-stick pan from them and it performed wonderfully. My only complaint is the handle design. It's comfortable enough but it gets quite hot. My other pan from Vollrath has a different handle design and it stays cool." "Bought this pan in several sizes a little over a year ago and use it for home cooking on an induction stove. I do have a CA degree and have worked in institutional kitchens in the past. The coating on these pans does not hold up around the edge of the pan and starts to peel off. We are very careful with the pans and how we use them. I called vollrath Cust Service and they reluctantly did replace one pan that we had a problem with but now the others are doing the same thing and they are now out of warranty. I have purchased other stainless vollrath pots and braisers and love them." "Bought a pair of 12" Vollrath Tribute non-stick pans to replace worn out T-Fal and Kitchen Aid pans of the same size. Tried scratch pancakes first. No extra oil or butter necessary to easily flip cakes. Then tried an omelette. Both the egg and cheese I added skittered around the pan on the no-stick surface. The three ply construction with aluminum encased in SS on interior and exterior gives pans a very rugged feel. You have the definite feeling they will never warp or become 'oval shaped' if dropped on the floor. Handle is attached super securely with four rivets, and does stay cool to touch even when using high heat to brown chicken, which I also did. Great pans!! Plan to buy a couple smaller pans of this type for flipping omelettes without a spatula as you are supposed to do anyway. Should not be a problem even for an avid family 'Dad-Cook' like me." "I have been trying to duplicate a favorite restaurant dish for the past year. First time in this pan and it came out PERFECT and so fast!!!!! Super even heat. I could not respond on durability since I've only owned it for a month. It is my new go to skillet!!!! Very very happy with this product!!!!!" "This is a very fine product so far. It heats up very nicely and the 400 degree oven temp allows me to finish delicate fish dishes in the oven. This product is made in Wisconsin and is infinitely better than the junk made in China."